Grime vocalist Tinchy Stryder has knocked dance pop star Calvin Harris off the top of the UK singles chart. 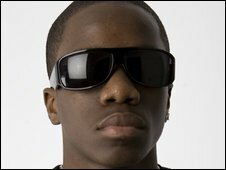 Number 1, which co-stars N-Dubz, was a new entry for the 21-year-old, whose real name is Kwasi Danquah. "It's just sinking in - it's mad. It's a great feeling," Stryder told BBC Radio One on hearing the news. It is the first time a single called Number 1 has reached the top spot. Other artists who tried and failed include Goldfrapp, Pharell and EYC. Elsewhere in the singles chart, compiled by the Official Charts Company, La Roux stayed at number two with In For The Kill while Harris dropped to number three with I'm Not Alone. Lady GaGa's Poker Face dropped to four but her album, The Fame, stayed at number one. Depeche Mode's Sounds of the Universe was the highest-charting new album, at two. Beyonce's album I Am... Sasha Fierce moved up four places to number three. Only By The Night from The Kings of Leon dropped two places to number four. London trio The Noisettes had the second highest new entry on the album chart with Wild Young Hearts at number seven. Other new entries included Fightstar's Be Human at 20 and My Maudlin Career from Glaswegian outfit Camera Obscura, which came in at 32. The band are just about to embark on a tour that takes in Ireland, the US and Canada before winding up with a performance at the Indietracks Festival in Derbyshire in July.